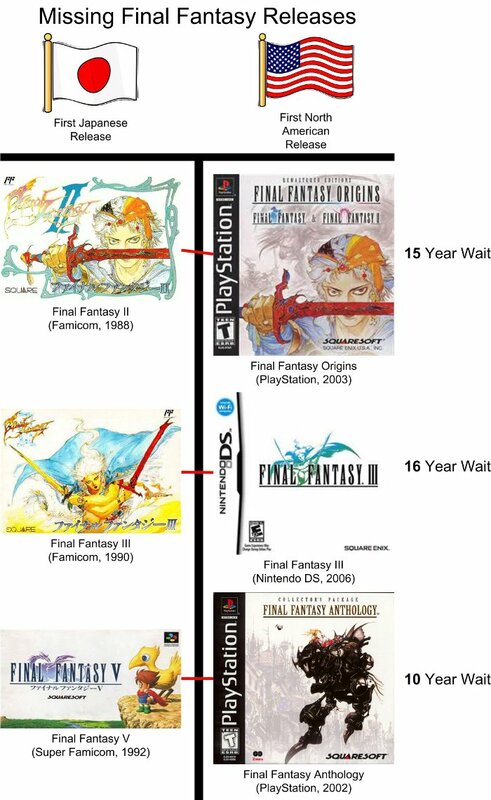 If you know anything about video games you probably know that the American numbering system for the Final Fantasy series is less than ideal. Back in the “golden age” of gaming of the 8-bit and 16-bit systems Japan was the #1 producer of video games. That usually meant there was lag time for localization from Japan to the States. During localization things got a little confusing, and most people were non-the-wiser. The Internet was pretty much non-existent and video games rags (see magazines) were the only source of information available and since they mostly aware of the localization, there was very few leaks of information in the differences. This lead to some pretty crazy changes in games, changes that would not fly today because they would be smeared all over the Internet. One notorious culprit of localization gone mad was the Final Fantasy series. 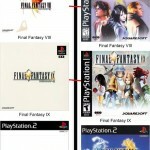 In America, we had Final Fantasy I,II,III, then VII. What happened to IV, V, IV? I remember that was a big question when VII came out. Where were our missing games and why didn’t we get them!?! There also was the possibility that Square just jumped to VII, but then why do that? Turns out there isn’t a really easy answer and you have to wade through some information to get the whole story. (I know I’m not the first to do this, but I aim to be the best) Luckily, I did that for you and did it in easy to understand graphics. 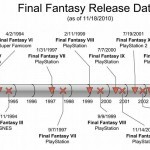 First here is the timeline of mainline Final Fantasy releases through today. Now you will notice that the North American releases are pretty spread out up until VII, but thats because some games were left out in the numbering. Basically, Square or Nintendo decided that the Japanese Final Fantasy II and III were not OK for American release so they skipped ’em. With Japan on III and North America still only having I they released Final Fantasy IV on Super Famicom (SNES) in Japan and it came over to the states as Final Fantasy II as it was our first Final Fantasy since the first one on the NES. 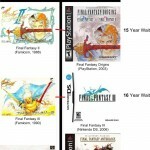 Then Japan released Final Fantasy V, but again it never made it over. So, Japan is now on V and we still have only 2 releases. Come Final Fantasy VI in Japan. This actually did see a western release as Final Fantasy III. Then it defaults to normal as the next North American release is Final Fantasy VIII; same as Japan. It’s pretty ridiculous to follow so I made another graphic to illustrate it. All the red lines tie their Japanese to North American counterpart. I included all the Japanese and North American box art to show the contrast. I hope this cleared things up for some people even if you couldn’t be less interested. This is not only for you guys, but it helps me remember too. Thanks for reading. Check back if you need affirmation that I indeed don’t have a life. But I decided to be nice and just tell you I was going to do that. Great visuals, though. I sorta knew the gist of this, but seeing it all laid out was pretty cool. Haha, well, I figured it wasn’t strictly mainline, but I appreciate it all the same. I’m glad it cleared things up. Thank you for validating my work. Previous PostPrevious On Upcoming Content.